Hem ANTIKVARISKA BÖCKER PERSONLIG UTVECKLING, PSYKOLOGI, SJÄLVHJÄLP Manligt/kvinnligt, relationer Warren Clark, Neil, Dr, "Falling in Love for all the Right Reasons: How to find your Soul Mate"
Warren Clark, Neil, Dr, "Falling in Love for all the Right Reasons: How to find your Soul Mate"
Hitta din perfekta partner - din själsfrände! 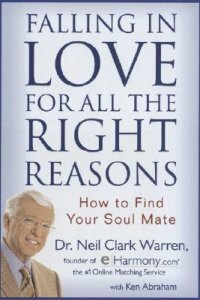 Dr. Neil Clark Warren is the mastermind behind eHarmony.com—an Internet matchmaking service that encourages readers to find "true love" rather than a slew of Saturday night dates. His basic shtick is that "broad-based compatibility" is the glue for making a partnership loving and lasting. Falling in Love offers 29 "dimensions of compatibility" to consider before committing to a romantic relationship. His formula is so, well, formulaic, it threatens to take all the mysticism and romance out of finding a soul mate. That’s fine with Warren, who believes that readers who screen partners for compatibility will fare much better than spirit-struck lovers who base commitments on profound immediate attraction. Warren begins with weeding out bad characters. "If one of the partners in a relationship lies, cheats, or steals, that bad character will eventually undermine the relationship." Even if you’re not the victim of these behaviors, you will be, claims Warren. So run, don’t walk from the relationship. Seems like obvious common sense. Yet advice columnist are constantly answering letters from unhappily married men and women, complaining about these very forms of broken trust. Warren also encourages readers to stop ignoring the early "red flags" of addictive personalities and psychological issues, such as chronic depression. Demand that the partner commit to professional help before you go any further with the relationship, he advises. Other compatibility issues include anger management, sexual passion, and family planning. While his advice is solid, it is conservative. For instance, he does not address homosexual love or allow homosexual partnering on his web site. Also, most of the discussion is geared toward traditional marriage as the final goal. --Gail Hudson --This text refers to an out of print or unavailable edition of this title. If you’re looking for your soul mate, you’ve probably heard of eHarmony.com, the online dating service founded by psychotherapist Warren and which he claims has resulted in 2,000 marriages. Here he shares the eHarmony.com formula, which consists of 29 personal dimensions that Warren says determine whether two people are compatible; they range from the obvious, like intellect, sense of humor and character, to more nuanced qualities like one’s sense of curiosity and level of artistic passion. Warren evaluates how important each dimension is (e.g., "Most people with strong artistic bents simply must be paired with partners who have similar interests") and how they can affect a relationship. Warren offers real-life stories to show how these dimensions play out in relationships, describing, for instance, the tensions created by mismatched energy levels, when one partner is full of get-up-and-go and the other is a couch potato. Warren’s dimensions of compatibility will ring true to those seeking not just a hot romance but a stable, long-term relationship. Inbunden, 238 sid., utg. år 2005. OBS på engelska! Sliwa, Lisa "Försvara dig, kvinna!" Sundbaum-Melin, Annika, "Singel i sumpan - hur man överlever det första året som ensamstående mamma" NYSKICK, ENDAST 1 EX! Parthenon förlag ger ut och säljer både nya och antikvariska böcker inom spännande områden som andlighet, personlig utveckling, paranormala fenomen, populärvetenskap och mycket annat. Önskemål, funderingar, frågor? Ring eller maila oss, så svarar vi så fort vi bara kan.